A good, high-quality sitemap is an integral part of search engine optimization. They offer this really simple way for site owners to share information with every search engine about the content they have on their site instead of having to rely solely on crawling algorithms. Many Content Management Systems let you easily create a sitemap with either native or third-party support. There are various free tools as well. 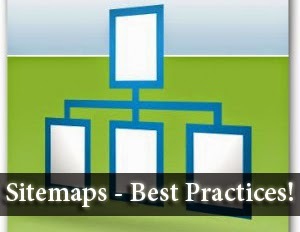 But if you really want a quality sitemap, here are some best practices that you need to keep in mind. The Sitemap protocol is defined at www.sitemaps.org, and is now widely supported. However, if you're developing your own sitemap, or using a third-party tool make sure the sitemap complies with the best practices. Use RSS feed, to list real-time all new and updated content posted on your site, during the last 24 hours. Avoid listing only the past 10 newest links on your site, search engines may not visit RSS as often as you want and may miss new URLs. Sites these days can be very large with millions of URLs. Each sitemap and sitemap index file can only link to 50,000 URLs. So if you need to cover more URLs, you can have a sitemap index file link to multiple sitemaps, or an index file linking to more index files! It is, however, recommended that you consider only the most relevant and useful URLs only, as search engines might not index all of them. The main problem with extra-large sitemaps is that search engines are often not able to discover all links in them as it takes time to download all these sitemaps each day. Search engines cannot download thousands of sitemaps in a few seconds or minutes to avoid over-crawling web sites. Between the time that index files are read, and then the sitemaps pointed to by them downloaded, they might have expired or over-written. To prevent such issues, a best practice is to manage two sets of sitemap files. Update one set on one day, and the other on the next. Keep alternating between them. You can have an index file referencing these two sets. This way, search engines will have enough time (24 hours) to download a set of sitemaps not modified and so will help ensure that they have discovered all your sites URLs in the past 24 to 48 hours. Got any more best practices that you think we have missed? Please feel free to share them with our readers!